You use Enterprises in your farm businesses. You have a fixed term contract with a dairy company. You have multiple supply numbers or milking sheds that sit under one GST number in your farm business. You are sharemilking and have different share percentages for different parts of the farm, OR, you want to create ‘What if’ budget scenarios that explore how a change in share percentage would impact your farm business. You choose to have more than one Dairy Forecaster due to personal preference. It’s important to consider how many Dairy Forecasters you need when setting up Cashmanager RURAL and when your business changes. Think about your business and the information that you want to obtain from the Dairy Forecaster and your budgets. 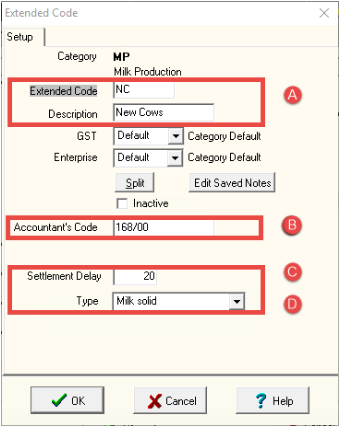 Tip: It is much better to set up the Dairy Forecaster(s) before creating budgets and entering transactions as this allows you to alter the extended codes and make sure that information will flow correctly through the system. When you create your budget, you can choose which Dairy Forecaster to enter Milk Production quantities into. Tip: If you have multiple supply numbers or share percentages consider creating separate Enterprises so that you can receive a more detailed picture of each business. Enterprising allows you to allocate income and costs more accurately and analyse performance and profitability for each part of the business. Kara is sharemilking 800 cows and she receives different share percentages for the cows she owns versus those belonging to Greg (the farm owner). Kara will need to set up separate Dairy Forecasters for each Milk Income share percentage. 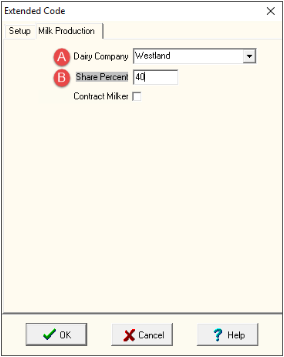 How do I set up multiple Dairy Forecasters? Tip: Changing codes needs to be done carefully as it will impact all budgets (past, present, and future). It is important to create new codes when you require multiple Dairy Forecasters. You will also need to create new codes if you want to experiment with business changes in ‘What if’ scenario budgets related to milk production. For instance, Kara wants to create a scenario budget where she sharemilks an additional 200 cows on a 40% share percentage. It is important that she doesn’t change her existing codes because this would change all her budgets; she will therefore create a new extended code to use in her scenario budget. Let’s use Kara as an example to walk through creating the new code. Step 1: From the Cashflow screen, click on Setup. 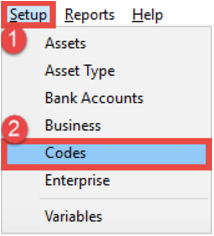 a. Click the + symbol next to Income to expand the list of codes. c. Click New: Extended Code. Step 4: Complete the Setup tab. a. Enter an Extended Code and Description that aren’t already in use and make sense to you. We recommend only 2-3 letters (or numbers) for the code. b. Enter an Accountant’s Code if known. c. Enter a Settlement Delay if appropriate to your business. d. Change Type to Milk Solid. This must be changed to Milk Solid for the code to be used with the Dairy Forecaster. Step 5: Complete Milk Production tab (appears when Milk Solid is selected). b. Alter Share Percent or select Contract Milker as appropriate. When Kara creates her new budget, she can see that there are now three lines under Milk Production that have the Milk Bottle icon indicating that they can be used in the Dairy Forecaster. When she clicks on the Dairy Forecaster button, she will be given the choice of which extended code she wants to select. For her scenario budget, she will select the new extended code she has just created: New Cows. Tip: Kara will be able to see her new extended code in all of her budgets. If she decides to delete her scenario budget, it would be a good idea for her to also delete the New Cows code so that it doesn’t clutter up her screen. She can do this by going to Setup > Codes, selecting New Cows, and then clicking Delete.